I was so excited to meet little Gavin after waiting for his arrival! He came after his original due date but was definitely worth the wait. He was perfect in every way and slept like a champ during his session, even allowing me to get that elusive “froggie” pose. That one only works when babies are super asleep as I have to take several photos and make a composite (for baby safety reasons), and Gavin certainly had the flexibility and was deep in sleep. I had the pleasure of taking this couples maternity photos as the Denver Botanic Gardens earlier this summer. I love seeing new families add their first little one as it such a life changing experience to capture for a couple. Mom requested my moon prop and traditional blue and grey colors. 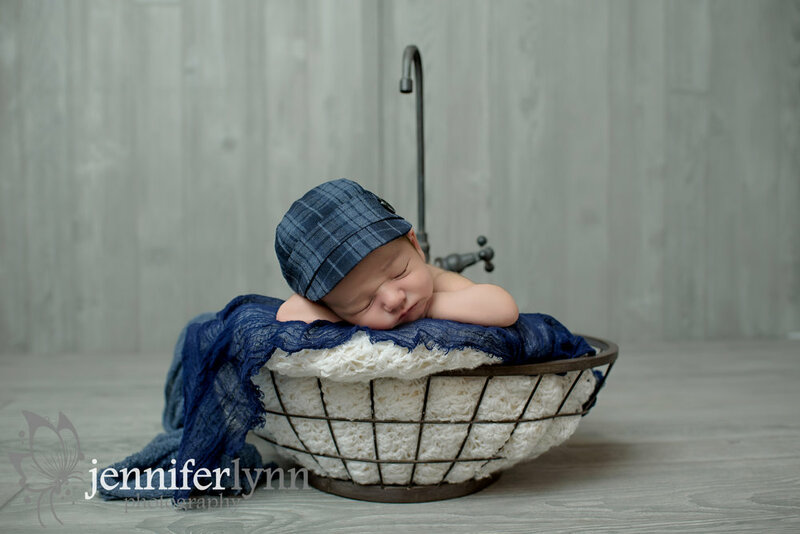 She also loved the sink prop, so I made sure to include that in their gallery of photos. I think my favorites, though, turned out to be the ones of Gavin on the soft fur with his parents hands and wedding rings. Wow was it hard to narrow down those images for the gallery! He was so flexible and his little feet just seemed to fold up into himself, so I was sure to capture that tiny detail as I know that will disappear all too quickly as he grows and gets his baby fat. I can already tell Gavin is surrounded by lots of love and family. A huge thanks to this couple for trusting me with these special memories! I hope to see you all again soon!